o EZ-2 Plus: Recommended for more difficult solvents with higher boiling points, as it is equipped with chamber heating and a more powerful pump. Suitable for water and HPLC fractions. o EZ-2 Elite: For the highest boiling point solvents, enhanced solvent recovery, improved final drying of stubborn samples and fast lyophilisation of HPLC fractions. HCL option available. Designed specifically for solvent removal in life science research for concentration, drying or lyophilisation of samples. Combines great performance, ease of use and compatibility with all commonly used solvents and acids, including TFA with low-cost option for use with hydrochloric acid and nitric acid. All-in-one compact design saves valuable bench space. Easier to use than a rotary evaporator. Versatile design accommodates a wide choice of sample types. High capacity H-shaped rotor design takes flasks, tubes, vials, reaction blocks, microtitre plates and SampleGenie. Evaporator has a range of robust, solvent resistant, oil-free vacuum pumps and the high efficiency, defrost-free SpeedTrap™, which traps all solvents as liquids — even water. Automatic draining of the SpeedTrap™ enhances solvent recovery further, and makes fast lyophilisation of HPLC fractions possible. Can operate entirely unattended. Just set the temperature, select the solvent type and press start. The unit controls the vacuum conditions, gradient and heater. Once the samples are dry or the concentration end point is reached, the system can stop automatically. Patented Dri-Pure sample protection system prevents cross-contamination and sample loss due to bumping. Insulated and plastic-coated, solvent-resistant glass collecting vessel allows condensed solvent levels to be easily seen. Auto-draining condenser jar. Solvent drain point. Easy access for routine maintenance. Polycarbonate reinforced glass window in lid. Integrated high efficiency solvent resistant diaphragm pumps. Timed methods may be set to stop the evaporator after a certain amount of time passes, or the Dri-Pure system automatically shuts off the system once the sample is dry/evaporated. The pause button enables samples to be checked without disturbing the automatic program. For safety, the lid only opens when the rotor has stopped. A low cost option is available for the Plus model for use with concentrated hydrochloric acid. Key elements of the system are engineered to provide full protection against these acids. This HCl option must be specified when ordering, as it cannot be retrofitted. The Plus model can also be used for evaporation of concentrated Nitric Acid. Max force: 500 x g.
Max sample load (including swings): 1.5 kg. Vacuum pressure display: 0 to 1200 mbar. Auto vacuum vent valve. Temperature control range: ambient to 80°C ±2.5°C. Chamber temperature range: ambient to 60°C. Condenser power: 70 watts max load. Condenser pot is made of vacuum insulated borosilicate glass. Condenser coils are FEP coated. When working with highly explosive solvents, such as diethyl ether or pentane, the Inert Gas Purge (IGP) system is mandatory. The IGP flushes all the air out of the system before the evaporation process starts, replacing it with an inert gas — nitrogen or argon. Additionally, the IGP system fills the system with inert gas when the evaporator stops, and can be used to keep sensitive samples under a gas blanket until removed by the operator. This option is available on all models. Highly chemically-resistant cold trap is designed to condense solvents, in order to protect the environment and help to speed evaporation. Runs at -50°C to catch the most volatile solvents. Does not freeze the condensed solvent, even when working with water. Solvents collected in the vessel enable user to check the progress of evaporation and determine when the trap should be emptied. The glass vessel is removed by a quarter turn, allowing the solvent to be poured directly into the waste container. ILMVAC pump with PTFE diaphragms and fittings are used to resist attack by even the most aggressive solvents. These pumps are designed for long life, quiet running and high performance. Controlled draining enables very high levels of solvent recovery to be achieved even when evaporating mixtures of solvents with widely varying boiling points, e.g. DMSO and methanol. Methanol can be collected, drained to the solvent waste and then the DMSO evaporated. Higher levels of dryness can be achieved by draining the volatile organic solvent before tackling the water, allowing full vacuum to be achieved during final drying when working with HPLC fractions. 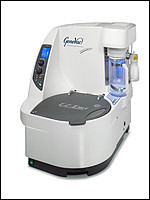 With the EZ-2 Elite SpeedTrap jar, the Genevac LyoSpeed™ method can now be used. The Genevac LyoSpeed™ method, or fast lyophilisation, was developed on the Genevac HT series evaporators for fast lyophilisation of HPLC fractions, mainly water and actonitrile. Solvents with a boiling point above 165°C may be dried on the EZ-2 Elite. Use of the Genevac Scroll pump and the internal enhancements to heat vapour ducts and system components enable the evaporation or solvents like DMSO and NMP (not permitted in the other models).